When you need slim fit tuxedos like you see Celebrities wear, Contempo Suits has just what you're seeking. This gray and black slim fit tuxedo features that slim fit you need and desire. 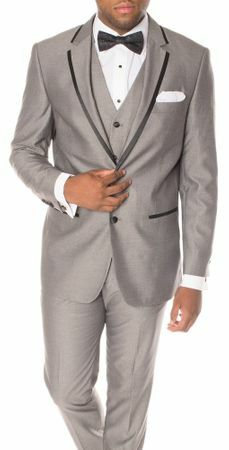 This gray and black slim fit tuxedo has a center vent style jacket that you'll look like a celebrity wearing on the red carpet. It comes with the matching vest and slim fit tapered leg pants with a flat front. Made of poly/rayon. Dress like a Boss the first time with this gray and black slim fit tuxedo from Contempo.